Caption sllip reads: "Photographer: Gaze. Date: 1952-02-18. Reporter: Caption only. Assignment: Santa Monica Pedestrian hit. 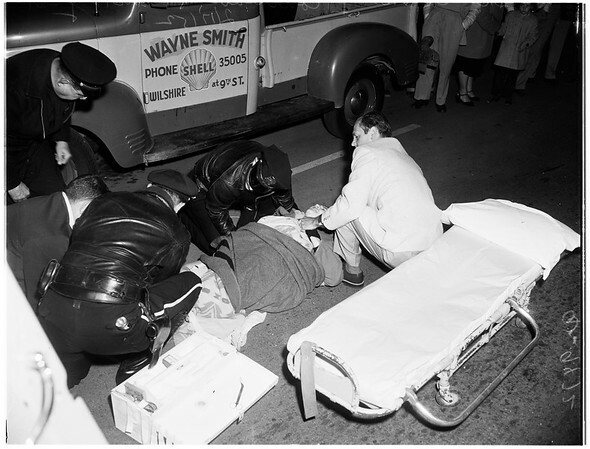 #27-28-41-42: Struck down by an automobile while crossing Wilshire Blvd. at 9th Street in Santa Monica, Mrs. Theresa Mary Courteau, 51, of 1534 Euclid Ave., Santa Monica, was seriously injured. At the Santa Monica Hospital today, it was reported she sustained upper and lower fractures of both legs, a fractured pelvis, fractured right arm and ribs. Driver of the auto, Norman Lee Williams, 17, high school student of 1447 Stanford Avenue, Santa Monica, was not held".